Just a quick note to say thanks to the generous AV folks who live in Christchurch (J & J W), for finding me and picking me up at the airport in Christchurch, putting me up for the night, feeding me, helping me plan fun adventures, and sending me on my way in the morning! 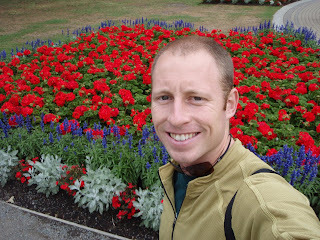 I spent about a day on my own in Christchurch, watching some street performers at the 2008 World Buskers Festival! See the video for more on that. Then spent the afternoon wandering around town, snacking, seeing the botanical gardens, art galleries, and the river Avon (they really think they're still in Britain). Met up with another group of backpackers who were heading out of town in the morning for Queenstown, and after some deliberation regarding timing, traveling with complete strangers, and advice seeking from across the globe, decided to take the ride. More on that in the next post! Needless to say, that for the city of Chch itself, 1 day was plenty. 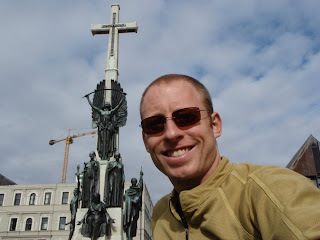 I realize that there's tons of good hikes along the foothills and Banks peninsula. Maybe another day! 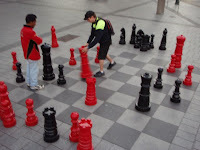 Oh, and they had a cool chess set in Cathedral square, too. 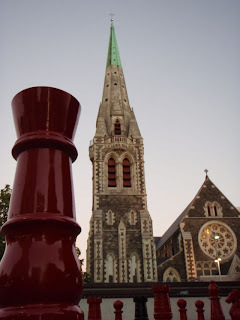 I like the pic of the church with chess piece in foreground. Looks like you're having a good time!